On sunday before the rains God went mad and started doing their dance we managed to see Dunkirk, Mr Nolan the great’s movie. And thats what I feel when I watch Christopher Nolan’s movies, he makes them with such deep thought, passion and persistence, not to forget he is a genius and yet every time he tries so hard to perfect his craft which gets better and better with the passing years. There are hardly any dialogues in the movie, its all about the visuals and he said he kept everything real used the least amount of special effects and that’s what gave me a deep experience. When I was watching Dunkirk, I felt it was just me and the movie screen, nothing else existed except for husband’s cheese popcorn which I finished half of it inspite of claming that I was on a diet. For once we liked the same movie thus on the way back home had a long conversation about the movie with the tick tock clock still clicking in the background of my mind. I am still not sure if Mr Movie Date understood exactly how I feel and how deeply I was touched by Mr. Nolan’s art and craft. I never go to a temple, few years back visited one, there people would lie on the floor flat rub their heads in front of the idols, i found it rather funny but if Mr. Nolan ever came in front of me I would do a shastang pranam to him, wait that would look funny but I would definitely bow down to him to show respect for the wonderful work he is doing. The only problem with his movies is the wait, its too many years then again if we live in eternity years is not at all long, I wish that was the case. Sharing this funny movie review, I was feeling like this, ecstatic like this fellow after watching Dunkirk… just like him ha ha ha. This video has no connection to Dunkirk but just like him I too was out of words and went on on .. Mr Christopher Nolan sir, Nolan sir .. sir ha ha ha. Since its raining the weather is perfect to have a hot steaming soup.. 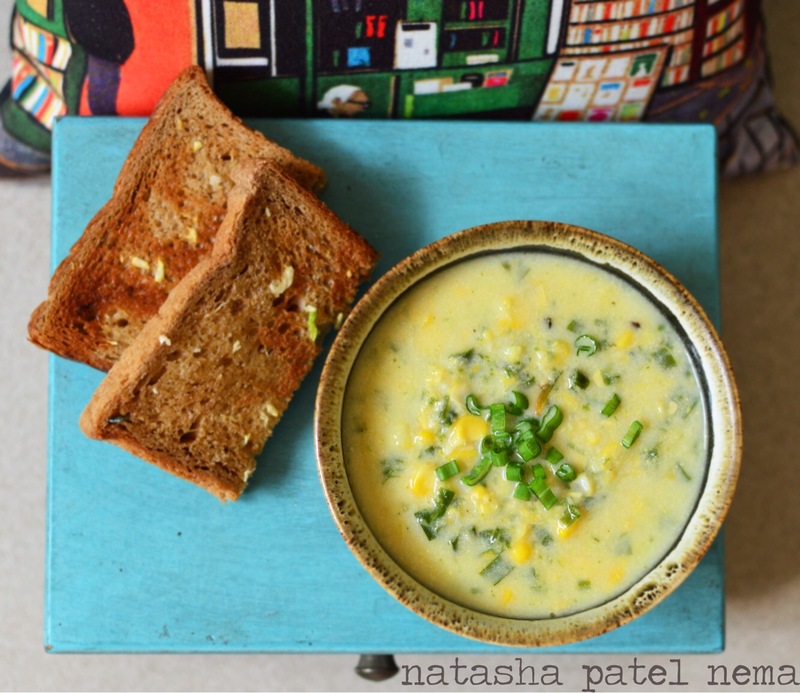 Sharing a recipe of a spring onion corn soup. 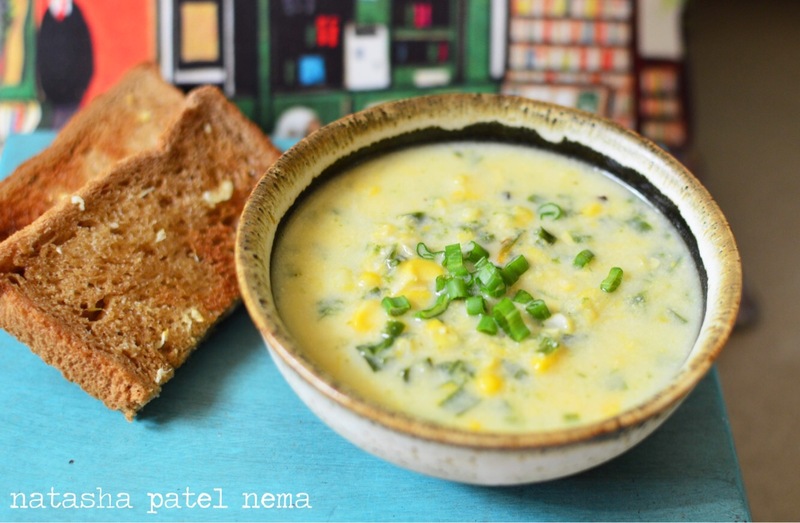 Blend milk, 1-2 cups of water, 2 cups of corn kernels and vegetable stock cube. Do not over blend it, do in such that corn kennels are corsly crushed. In a pot heat the butter, add the spring onions and saute for a minute. To this add the blended mixture , rest of the corn kernels , green chilli, salt and pepper. Let in simmer on low for about 10 minutes till the soup is thick and all the seasoning is mixed well.